Technai Team develops Direct Drive technology with a leaning towards offering customised solutions. The machine tool industry represents our long-standing specialisation, however, the application field of torque drive technology is being consolidated in many sectors. Technai is fully dedicated to and cooperates with customers who approach new applications, placing particular attention on delivering the full added value achievable and highlighting the advantages of a torque drive as opposed to conventional solutions. Rotary worktables, in the single direction and/or stepless versions. 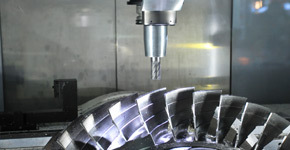 Combined milling-turning tables for multitasking machining centres. Rotary axes for cylindrical and complex profile grinding with outstanding motion quality. Rotary axes for gear-cutting machines. Drives for transfer machine tables. Rotary axes for milling heads with 4th and 5th axis. Drives for non-conventional electric spindles. Central drum drives for flexographic printing machines. Drives for the rollers of offset, flexographic, rotogravure and silk screen printing machines for totally gearless printing lines. Rotary tables with intermittently programmable rotation (rotary transfer machines). Axes and rotary units with programmable movements for automatic machines. Actuators with complex kinematics generated by rotation (e.g. parallel kinematics).